The 2014 Religious Landscape Study is a follow-up to an equally extensive survey on religion in America, conducted in 2007. An initial report on the findings from the 2014 study, released in May 2015, described the changing size and demographic characteristics of the nation’s major religious groups. This report focuses on Americans’ religious beliefs and practices and assesses how they have changed in recent years. The share of U.S. adults who say they believe in God, while still remarkably high by comparison with other advanced industrial countries, has declined modestly, from approximately 92% to 89%, since Pew Research Center conducted its first Landscape Study in 2007.1 The share of Americans who say they are “absolutely certain” God exists has dropped more sharply, from 71% in 2007 to 63% in 2014. And the percentages who say they pray every day, attend religious services regularly and consider religion to be very important in their lives also have ticked down by small but statistically significant margins. 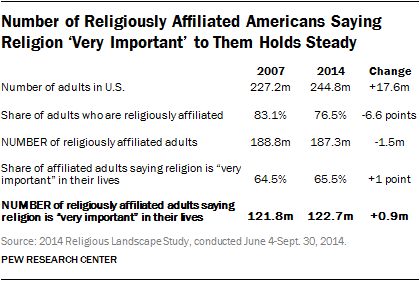 At the same time, the vast majority of Americans (77% of all adults) continue to identify with some religious faith. And this religiously affiliated population – comprising a wide variety of Protestants as well as Catholics, Jews, Mormons, Muslims, Buddhists, Hindus and adherents of other faith traditions – is, on the whole, just as religiously committed today as when the study was first conducted in 2007. 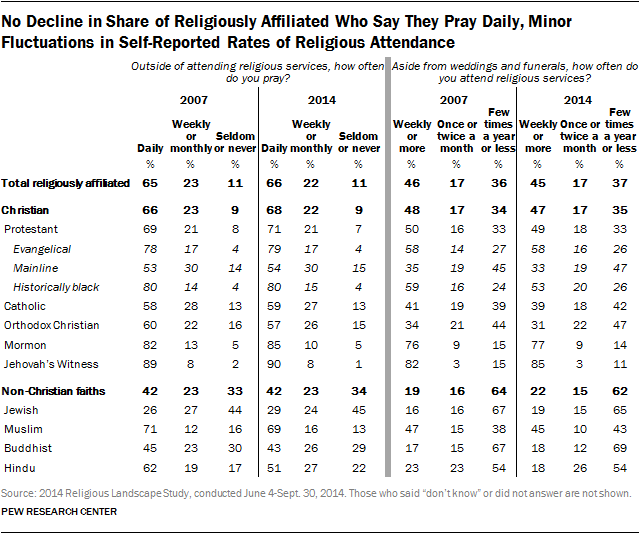 Fully two-thirds of religiously affiliated adults say they pray every day and that religion is very important to them, and roughly six-in-ten say they attend religious services at least once or twice a month; those numbers have changed little, if at all, in recent years. And nearly all religiously affiliated people in the survey (97%) continue to believe in God, though a declining share express this belief with absolute certainty (74% in 2014, down from 79% in 2007). The study also suggests that in some ways Americans are becoming more spiritual. About six-in-ten adults now say they regularly feel a deep sense of “spiritual peace and well-being,” up 7 percentage points since 2007. And 46% of Americans say they experience a deep sense of “wonder about the universe” at least once a week, also up 7 points over the same period. As noted above, this is the second report on the results of the 2014 Religious Landscape Study. The first report, published in May 2015, focused on the changing religious composition of the U.S. public. It documented the continued, rapid growth of the religiously unaffiliated population and described the importance of generational replacement in driving the rise of the “nones.” As older cohorts of adults (comprised mainly of self-identified Christians) pass away, they are being replaced by a new cohort of young adults who display far lower levels of attachment to organized religion than their parents’ and grandparents’ generations did when they were the same age. The same dynamic helps explain the declines in traditional measures of religious belief and practice. Millennials – especially the youngest Millennials, who have entered adulthood since the first Landscape Study was conducted – are far less religious than their elders. For example, only 27% of Millennials say they attend religious services on a weekly basis, compared with 51% of adults in the Silent generation. Four-in-ten of the youngest Millennials say they pray every day, compared with six-in-ten Baby Boomers and two-thirds of members of the Silent generation. Only about half of Millennials say they believe in God with absolute certainty, compared with seven-in-ten Americans in the Silent and Baby Boom cohorts. And only about four-in-ten Millennials say religion is very important in their lives, compared with more than half in the older generational cohorts. In addition to exploring religious beliefs and practices, the new Religious Landscape Study includes questions about Americans’ social and political values. In some ways, the basic patterns in religion and politics in the United States remain unchanged. Some religious groups (including evangelical Protestants and Mormons) are generally supportive of the Republican Party, while other groups (including Jews, religious “nones,” Hispanic Catholics and members of churches that belong to the historically black Protestant tradition) tend to be more Democratic in their partisan allegiances. The study also shows that the growth of the “nones” is having a particularly pronounced impact on the Democratic Party coalition. In fact, religious “nones” are now more numerous among Democrats and Democratic-leaning adults than are Catholics, evangelical Protestants, mainline Protestants or members of the historically black Protestant tradition. The religiously unaffiliated also are growing within the GOP, though not as quickly, and they remain far outnumbered by evangelicals and less numerous than Catholics or mainline Protestants within the Republican coalition. The remainder of this Overview explores in greater depth the religious changes that are underway in the American public. It describes how the stability of religious practice among the shrinking share of the population that is religiously affiliated, coupled with declining rates of religious observance among the growing minority of religious “nones,” is producing overall declines in several key measures of religious practice. It explains the importance of generational replacement – the gradual supplanting of older generations by newer ones – in driving these trends. The Overview also highlights an increase in the share of Americans who say they regularly have certain spiritual experiences, describes the public’s views of religious institutions and briefly summarizes several key findings about the connection between religion and politics. Subsequent sections of the report provide additional information on all of these topics, with full details on the beliefs, practices and attitudes of many of the diverse religious groups that populate the U.S. religious landscape. And Appendix B includes a description of how the findings from the Religious Landscape Study compare with other major religion surveys. The new Religious Landscape Study shows that most people who identify with a religion ascribe a high level of importance to their personal faith and say they participate in religious activities on at least an occasional basis. In several important respects, the religiously affiliated are just as highly observant and engaged with their respective faith traditions today as they were when the Landscape Study was first conducted in 2007. 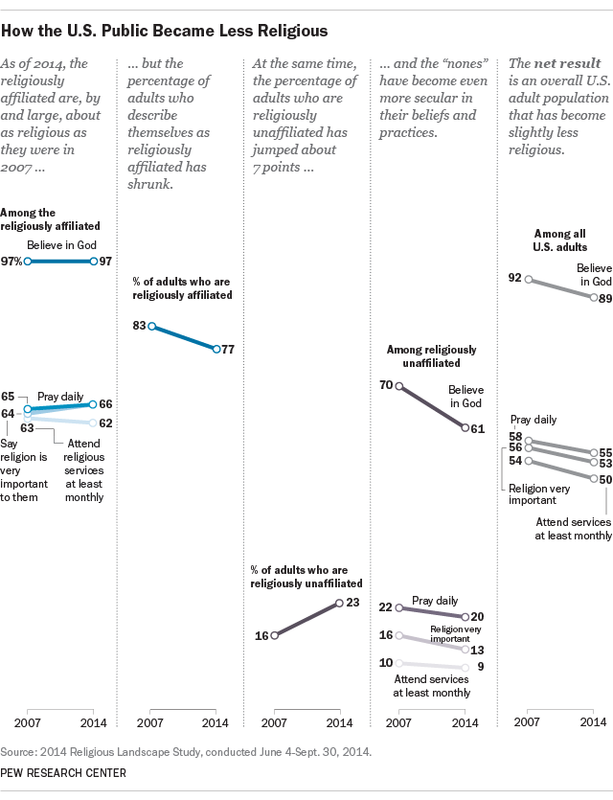 While much is changing in American religious life, the level of religious observance exhibited by those who identify with a religion is, by and large, stable. For example, two-thirds of religiously affiliated adults say religion is very important in their lives. One-quarter say religion is “somewhat” important in their lives, and about one-in-ten say religion is “not too” or “not at all” important to them (9%). These shares are little changed from 2007. The amount of importance people attach to religion varies considerably depending on the religious tradition to which they belong.3 Large majorities (roughly eight-in-ten or more) of evangelical Protestants, as well as Protestants who belong to churches that are part of the historically black Protestant tradition, Mormons and Jehovah’s Witnesses say religion is “very important” in their lives, while roughly six-in-ten or fewer mainline Protestants and Catholics say the same.4 But across most religious traditions, and among the religiously affiliated group as a whole, there has been little change in the importance people attach to religion’s place in their lives. While stability is perhaps the best single word to sum up the Landscape Study’s findings about the religious beliefs and practices of religiously affiliated Americans, the trends among the religiously unaffiliated segment of the population look more like secularization. 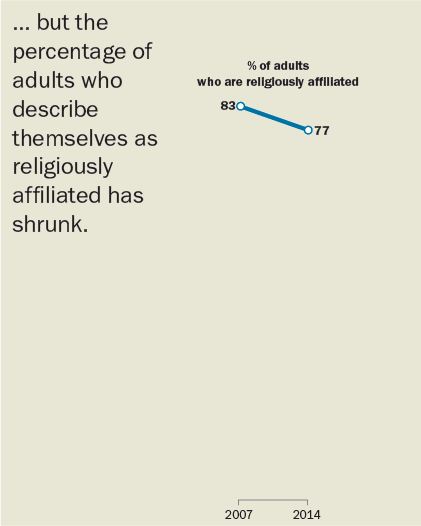 Not only have the unaffiliated grown in size, they also have become less religious over time. For example, the share of religious “nones” who say religion is “very important” in their lives has declined by 3 percentage points in recent years, and the share saying religion is “somewhat” important in their lives has declined by 4 points. Meanwhile, the share of religiously unaffiliated adults who say religion is either “not too important” or “not at all important” to them has grown by 8 percentage points since 2007. Roughly two-thirds of the “nones” now say religion is of little importance in their lives, up from 57% in 2007. Similarly, the Religious Landscape Study finds that 62% of religious “nones” now say they “seldom” or “never” pray, a 6-point increase since 2007. And while there has been little change in the rate at which “nones” report attending religious services (few did this more than a few times a year to begin with), the proportion of “nones” who say they do not believe in God has grown rapidly in recent years. Fully one-third of religiously unaffiliated adults now say they do not believe in God, up 11 points since 2007. As a result of these two trends – growth and secularization among the religiously unaffiliated – the share of Americans who exhibit high religious commitment is declining. For instance, the share of Americans saying religion is “very” or “somewhat” important in their lives has declined, while the share saying religion is “not too” or “not at all” important to them has grown by 5 percentage points. There has been a modest decline in the share of adults who say they pray at least monthly, while the share of people who say they seldom or never pray has increased by nearly 5 points. And about half of adults now say they attend religious services no more than a few times a year, up almost 5 points since 2007. Meanwhile, the share who report that they attend services weekly has dropped by nearly 4 points, to roughly 36%. These changes are happening even though the absolute number of Americans who are highly religiously engaged has not changed very much. In other words, the United States is growing less religious (in percentage terms) not because there are fewer highly religious people but rather because, as the overall U.S. population has grown, there are now many more nonreligious people than was the case just a few years ago. At the other end of the religion spectrum, there has been rapid growth in the number of unaffiliated adults who say religion is not important to them. In 2007, 16.1% of adults – 36.6 million people – described themselves as religious “nones.” And 57.5% of them said religion was “not too” or “not at all” important in their lives, yielding an estimate that 21.0 million adults were religious “nones” for whom religion was personally unimportant. By 2014, the religiously unaffiliated share of the population had grown to 22.8%, and the number of religious “nones” had ballooned to 55.8 million. And nearly two-thirds of the “nones” – 36.1 million adults – say religion is unimportant to them, an increase of roughly 15 million people in just seven years. The data show similar patterns in questions about prayer and attendance at religious worship services. The number of religiously unaffiliated adults who say they seldom or never pray and the number who say they seldom or never attend services have grown rapidly. Meanwhile, the numbers of religiously affiliated adults who say they pray daily and attend services regularly have been comparatively stable. The result is that the percentages of Americans who pray daily and attend religious services regularly have declined modestly. For more details on the study’s findings about trends in religious beliefs and practices, see Chapter 1 and Chapter 2. Similarly, the Religious Landscape Study finds that, at least on some measures, there is a tendency for people to become more religious as they get older. 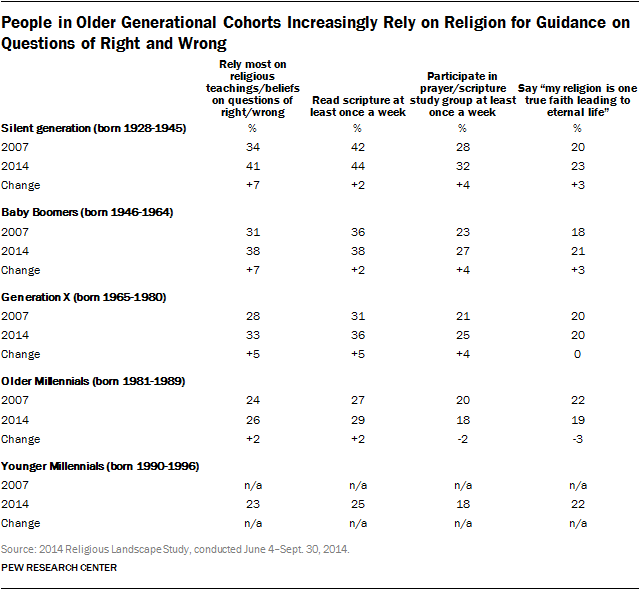 For example, Generation Xers, Baby Boomers and those in the Silent generation all have become somewhat more inclined in recent years to say they rely mainly on their religious beliefs when thinking about questions of right and wrong; they also are more likely to say they read scripture regularly and participate in prayer groups or scripture study groups on a frequent basis. 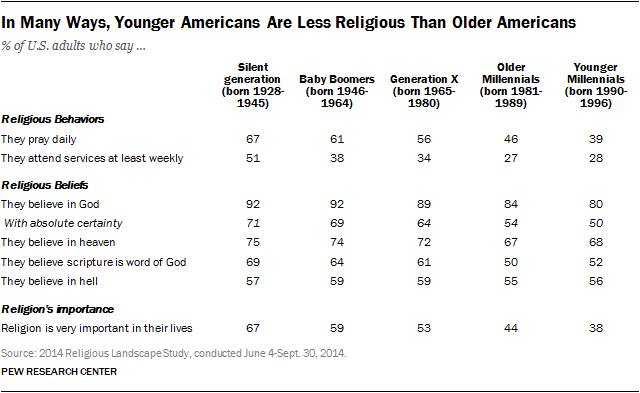 Baby Boomers and those in the Silent generation also have become more likely to say their religion is the “one true faith leading to eternal life.” However, older Millennials have not become substantially more likely to participate in small-group religious activities or say they rely on religion for guidance on questions of right and wrong. Furthermore, in the seven years since the first Religious Landscape Study was conducted, no generational cohort has become more religious as measured by self-assessments of religion’s importance in their lives, frequency of prayer or frequency of church attendance. Indeed, older Millennials – adults who were between the ages of 18 and 26 when the first Religious Landscape Study was conducted in 2007 and who today are in their late 20s and early 30s – are, if anything, less religiously observant today than they were in 2007 in these important ways. 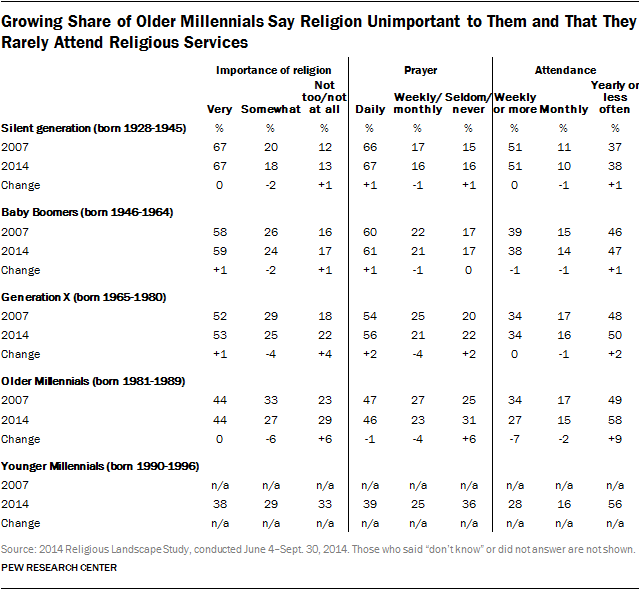 The share of older Millennials who say they seldom or never attend religious services has risen by 9 percentage points. 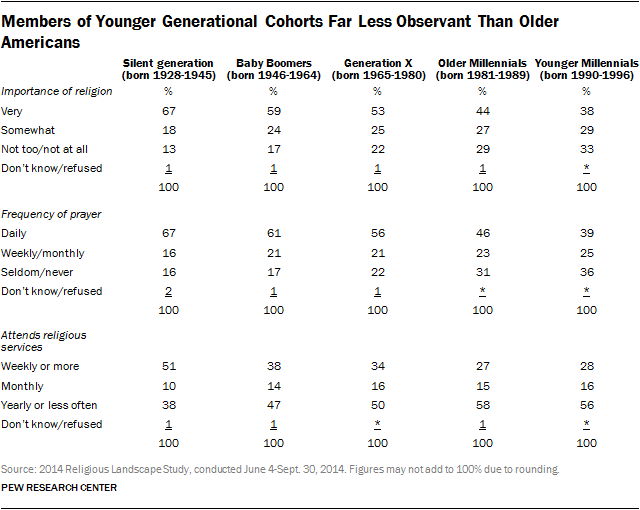 And the share of older Millennials who say they seldom or never pray has risen by 6 points, as has the share who say religion is “not too” or “not at all” important in their lives. Rise of the ‘Nones’: Is It Just a Change in Nomenclature? As the share of religiously unaffiliated Americans has risen rapidly in recent years, some observers have suggested that this is merely a change in labels. There always have been people who identify with a religion but are not particularly devout or active — self-identified Catholics, Methodists, Lutherans, Jews, etc. who do not regularly pray, attend religious services or participate in other religious activities. All that has really changed – so the thinking goes – is that these nominally affiliated but largely non-practicing individuals have begun to describe themselves as religious “nones,” while the share of Americans who are truly observant has not diminished. The results of the Religious Landscape Study suggest that relabeling is part of what has taken place, but it is not the whole story. The religious beliefs and practices of the U.S. public as a whole also are changing. Relabeling. To be sure, the growth of the “nones” is concentrated among people with low or moderate levels of religious commitment. For instance, among those who say religion is “not too important” or “not at all important” in their lives, there has been a sharp rise in the share who identify as “nones.” In the past, some of these people might have claimed a religious affiliation, but they increasingly describe themselves as atheist, agnostic or nothing in particular when asked about their religious identity (68% in 2014, up from 57% in 2007). Declining Religiosity. At the same time, the share of the population with low levels of observance (e.g., those who seldom or never pray or go to religious services, and who say religion is unimportant in their lives) has, itself, grown. And the percentage of American adults who are highly observant – at least as measured by traditional indicators, such as their certainty of belief in God, frequency of prayer, self-reported rates of attendance at worship services and self-assessments of the importance of religion in their lives – has declined. Generational Replacement. To understand what is driving religious change, it is important to recognize trends in American society as a whole, not just how individuals change over their lifetimes. Of course, some individuals grow more religious over time, while others grow less religious. And the “nones” may be growing in part because some people in their 40s, 50s and 60s who had only weak ties to religion are dropping any vestige of identification with the faith in which they were raised. But one of the major factors behind the growth of the “nones,” and the declines in traditional forms of religious observance, appears to be generational. Older generations of American adults who were overwhelmingly Christian by affiliation and comparatively devout in belief and behavior are gradually passing away. They are being replaced by a new generation of young people who are, on the whole, less inclined to identify with any branch of Christianity and more religiously unaffiliated than older cohorts ever were, even when they were young. And so far, members of the Millennial generation do not seem to be growing more religiously observant as they get older, at least by traditional measures. On the contrary, the oldest Millennials, now in their late 20s and early 30s, are generally less observant than they were seven years ago. If these trends continue, American society is likely to grow less religious even if those who are adults today maintain their current levels of religious commitment. Less Religious, but More Spiritual? While several key indicators of traditional forms of religious observance are declining, the Religious Landscape Study shows that the U.S. population may be becoming more spiritual in certain ways. Roughly six-in-ten adults now say they feel a deep sense of spiritual peace and well-being at least once a week, up 7 percentage points since 2007. And 46% of adults say they feel a deep sense of wonder about the universe on a weekly basis, also up sharply since 2007. Groups that exhibit the highest levels of traditional forms of religious observance also are most likely to say they regularly experience a sense of spiritual peace and well-being. Nearly two-thirds of religiously affiliated adults, for instance, say they feel a deep sense of spiritual peace at least once a week, compared with four-in-ten religious “nones.” And among the religiously affiliated, about eight-in-ten Mormons and three-quarters of those in the evangelical and historically black Protestant traditions (some of the most religiously observant groups in the U.S.) say they experience a deep sense of spiritual peace at least once a week. But there is little difference between the religiously affiliated and religious “nones” on the question about feelings of wonder about the universe. And the increases seen on both of the questions about spiritual experiences are demographically broad-based, having occurred among those who are religiously affiliated and religious “nones,” among people of all ages, among both men and women, and in all regions of the country. To explore other aspects of spirituality, the 2014 survey included two new questions that were not asked in the 2007 Religious Landscape Study. The first question asked respondents how often they feel a strong sense of gratitude or thankfulness. More than three-quarters of adults – including 82% of Christians – say they feel a strong sense of gratitude or thankfulness at least once a week. Large majorities of those belonging to non-Christian faiths (including 77% of Muslims, 73% of Buddhists, 70% of Jews and 62% of Hindus) also report regularly feeling a strong sense of gratitude, as do two-thirds of the religiously unaffiliated. The study finds that regularly feeling a strong sense of gratitude is most common among those who are highly religiously observant. Fully 90% of those who say they attend religious services at least once a week also say they feel a deep sense of gratitude at least once a week, as do 88% of those who say religion is “very important” in their lives. But gratitude also is experienced regularly by many people who are not very religiously observant. For example, two-thirds of people who say they seldom or never attend religious services say they regularly feel a deep sense of gratitude (67%), as do 62% of those who say religion is “not too” or “not at all” important in their lives. In addition to asking about feelings of gratitude, the new study also asked respondents how often they think about the meaning and purpose of life. Slightly more than half of Americans (55%) – including 59% of Christians, 53% of members of non-Christian faiths and 45% of religious “nones” – say they think about the meaning and purpose of life at least once a week. Regular contemplation of life’s meaning is most common among those who are religiously observant in a variety of ways. For example, two-thirds of those who say religion is “very important” in their lives (67%) also say they regularly think about the meaning and purpose of life, compared with 38% of those who say religion is “not too” or “not at all” important to them. For more details on the study’s findings about Americans’ spiritual experiences, see Chapter 2. The new study shows that most Americans continue to view organized religion as a force for good in American society. Nearly nine-in-ten adults say churches and other religious institutions bring people together and strengthen community bonds and that they play an important role in helping the poor and needy. And three-quarters say churches and other religious institutions help protect and strengthen morality in society. Attitudes on these questions are little changed from 2012, when they were first asked in a Pew Research Center survey. These views are widely held even by the religiously unaffiliated, though the survey suggests that many religious “nones” are ambivalent or hold conflicting views about organized religion’s impact on society. In addition to saying that churches and other religious institutions perform good works, large numbers of the unaffiliated also say religious institutions are too concerned with money and power, too involved in politics and too focused on rules. When all of the survey’s questions about religious institutions are analyzed together, they show that 42% of adults have a mostly positive view of religious institutions – that is, they agree with all three positive statements (that religious institutions strengthen community bonds, help the poor and protect morality) while agreeing with no more than one negative statement, or they agree with two positive and zero negative statements. Far fewer adults (7%) express mostly negative views about churches and other religious organizations – meaning they agree with all three negative statements (that religious institutions are too concerned with money and power, too involved in politics and too focused on rules) while agreeing with no more than one positive statement, or they agree with two negative and zero positive statements. Half of the public expresses mixed views. Americans who identify with a religion are fairly evenly divided between those who express mostly positive views of religious institutions (49%) and those who express mixed views (46%). 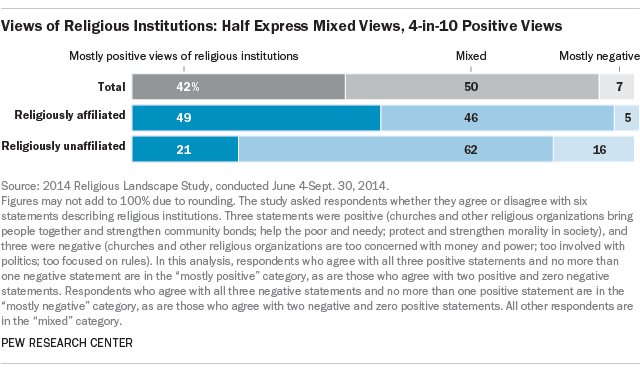 Few religiously affiliated adults (5%) express mostly negative views of religious institutions. Most religious “nones” (62%) express mixed views of religious institutions, with the remainder divided between those who express mostly positive views (21%) and those who express mostly negative views (16%). For more details on American views of religious institutions, see Chapter 3. In addition to exploring religious beliefs and practices, the new Religious Landscape Study also includes questions about Americans’ partisan allegiances and their social and political values. The survey data show that Christians are declining and religious “nones” are growing within both major political parties. But the changing religious composition of the U.S. population is particularly evident among the Democratic coalition. Fewer than two-thirds of Democrats and Democratic-leaning adults now identify with any branch of Christianity, down 11 percentage points since 2007. Meanwhile, nearly three-in-ten Democrats say they have no religion, up 9 points in recent years. Religious “nones” now constitute the single largest religious category in the Democratic coalition. As recently as 2007, mainline Protestants, evangelical Protestants and Catholics were each about as numerous as – or more numerous than – the religiously unaffiliated among Democrats and Democratic-leaning adults. Religious “nones” also are growing within the Republican coalition, but they are doing so at a slower rate; 14% of Republicans and Republican-leaning adults now say they have no religious affiliation, up modestly from 10% in 2007. More than eight-in-ten Republicans continue to identify with Christianity, including nearly four-in-ten Republicans and Republican-leaning adults who identify with evangelical Protestant denominations. While the religious “nones” are growing within the population as a whole and especially among Democrats, their potential political impact is mitigated by comparatively low levels of engagement in the political process. About seven-in-ten adults who identify with a religion (71%) say they are sure they are registered to vote, but just 62% of religious “nones” say the same. 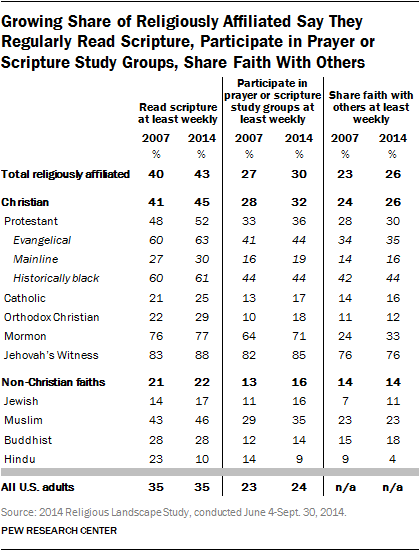 And exit polls show that as a share of the electorate, religious “nones” are growing very slowly. In the 2012 presidential election, for instance, 12% of voters identified themselves as religiously unaffiliated, which was identical to the share in 2008 and only slightly higher than the shares in 2004 (10%) and 2000 (9%). The new survey also asked respondents about their views on a number of social issues, including homosexuality. The survey finds that acceptance of homosexuality is growing rapidly even among religious groups that have traditionally been strongly opposed to it. For instance, more than a third of evangelical Protestants now say homosexuality should be accepted by American society, up 10 points since 2007. And acceptance of homosexuality has jumped by 12 points among Mormons. 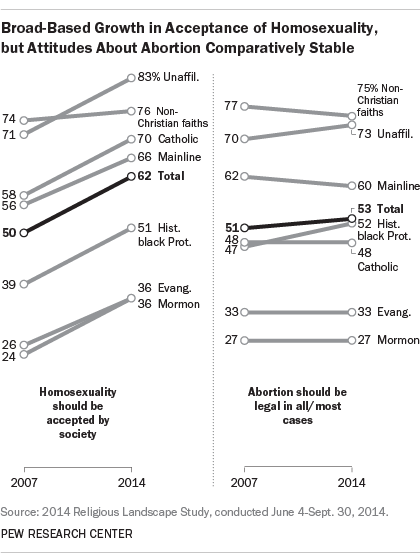 Compared with views on homosexuality, there has been little change in Americans’ attitudes about abortion. Among the public as a whole, slightly more than half (53%) say abortion should be legal in all or most cases. Views on abortion have changed little across most major religious groups, although those who are unaffiliated and those who belong to historically black Protestant churches are somewhat more likely to support legal abortion than in the recent past. The shifts in attitudes toward homosexuality among the largest religious groups are being driven partly by young adults, who are much more accepting of homosexuality than older Americans. Among evangelical Protestants, for example, 51% of Millennials say homosexuality should be accepted, compared with about a third of Baby Boomers and a fifth of those in the Silent generation. Similar patterns are seen among mainline Protestants, in the historically black Protestant tradition and among Catholics. The survey also finds generation gaps within many religious groups in attitudes about a variety of other social and political issues. Young adults generally express more politically liberal opinions than older people when asked about the environment, the proper size and scope of government, and immigration. 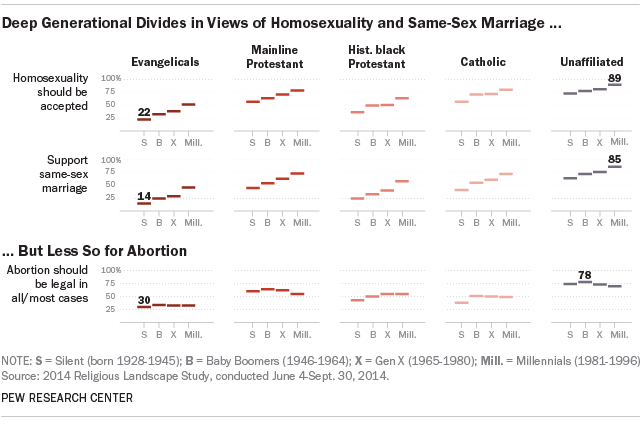 One exception to this pattern is abortion; here, generational differences within religious groups are less consistent. For example, Millennials who are evangelical Protestants are no more supportive of abortion rights than evangelicals from the Baby Boom or Silent generations, and Millennials in the mainline Protestant tradition are somewhat less supportive of legal abortion (55%) than those in older generations. And while Catholics in the Silent generation are more opposed to legal abortion than other Catholics, there is little difference in the views of Catholic Baby Boomers, Generation Xers and Millennials. For more details on the social and political views of religious groups, see Chapter 4. Like the growth of the religiously unaffiliated, the growing share of people who exhibit low levels of traditional forms of religious observance is demographically broad-based. Religious commitment – as measured by respondents’ self-assessments of religion’s importance in their lives, frequency of prayer and religious attendance – has declined among men and women, college graduates and those with less education, married and unmarried respondents, people in every region of the country and people with various racial and ethnic backgrounds. While the vast majority of Americans continue to say they believe in God, the share of adults who profess belief in God has declined from 92% to 89% since 2007, and the share of those who express absolutely certain belief in God has declined by 8 points during the same period. The decline in belief in God has been particularly steep among the religiously unaffiliated, but even Christians increasingly express uncertainty about the existence of God; while nearly all Christians in the survey (98%) believe in God, 76% now say they are absolutely certain that God exists, down from 80% in the first Religious Landscape Study in 2007. While the share of Americans who believe in God has ticked downward, among those who do believe in God, there has been very little change in views about God’s nature. Currently, roughly two-thirds of adults who believe in God (64%) say they see God as a person with whom they can have a relationship, and 29% say they view God as an impersonal force. When the Religious Landscape Study was first conducted in 2007, 64% of those who believed in God said they think of God as a person, and 27% said they view God as an impersonal force. Six-in-ten adults – and three-quarters of Christians – believe the Bible or other holy scripture is the word of God. Roughly three-in-ten adults (31%) and four-in-ten Christians (39%) go a step further and say the Bible should be interpreted literally, word for word. Biblical literalism is most common among those in the historically black Protestant tradition (59%) and evangelical Protestant tradition (55%). Among religious “nones,” there has been a modest decline in the share who say the Bible is the word of God (from 25% in 2007 to 21% in 2014). Fully 85% of Jehovah’s Witnesses say they attend religious services at least once a week, as do 77% of Mormons. Most evangelical Protestants (58%) and members of historically black Protestant churches (53%) also report attending religious services at least once a week. Among most other religious groups, however, fewer than half of adherents say they attend religious services weekly. Nearly two-thirds of U.S. women (64%) say they pray every day. By comparison, fewer than half of U.S. men (46%) say they pray daily. Women also are more likely than men to say they attend religious services on a weekly basis (40% vs. 31%). The survey asked respondents what they think about three changes that have taken place in American society over the last 50 years: more women in the workforce, more people having children without getting married and the growing population of immigrants. In regard to each of these changes, respondents were asked whether it “has been a change for the better, a change for the worse, or hasn’t this made much difference?” Large majorities in most religious groups say having more women in the workforce has been a change for the better. There is less consensus about more children being born out of wedlock. Most Christians and Muslims say this has been a change for the worse. Jews, by contrast, are more divided between those who see increasing out-of-wedlock births as a change for the worse and those who say it has not made much difference. And most atheists and agnostics say this development is neither positive nor negative. The public is divided on the impact of immigration; 35% say the growing population of immigrants has been a change for the worse, but 26% say it is a change for the better and 30% say it has not made much difference. Nearly half of evangelical Protestants say the growing number of immigrants has been a change for the worse, far higher than the share of other religious groups who say the same. Full details on the questions about changes in American society are available in Chapter 4. This is the second report on findings from the 2014 U.S. 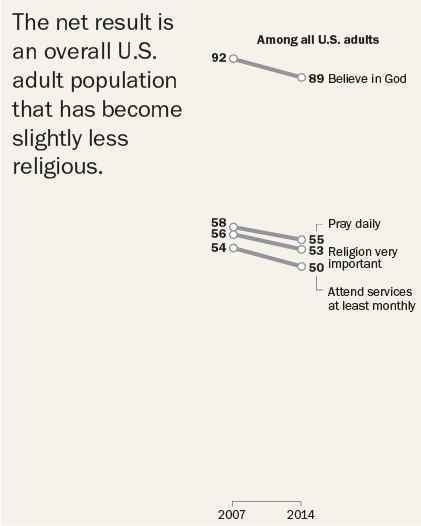 Religious Landscape Study, the centerpiece of which is a nationally representative telephone survey of 35,071 adults. The first report on the study’s findings was published on May 12, 2015; it focused on the changing religious composition of the United States and described the demographic characteristics of U.S. religious groups. It also summarized patterns in religious switching and intermarriage. The new report describes the religious beliefs and practices of the U.S. public and assesses how they have changed over time. It also documents the social and political values of the religious groups that populate the U.S. religious landscape. This is the second time Pew Research Center has conducted a Religious Landscape Study. The first was conducted in 2007, also with a telephone survey of more than 35,000 Americans. With more than 35,000 interviews each, both the 2007 and 2014 studies have margins of error of less than 1 percentage point, making it possible to identify even relatively small changes in the U.S. religious landscape. Other findings from the 2014 Religious Landscape Study will be released later this year. In addition to the written reports, the Religious Landscape Study’s findings are available through a new interactive tool. The online presentation allows users to delve more deeply into the survey’s findings, build interactive maps or charts and explore the data most interesting to them. Many individuals from Pew Research Center contributed to this report. Alan Cooperman, director of religion research, oversaw the effort and served as the primary editor. Gregory A. Smith, associate director for religion research, served as the primary researcher and wrote the Methodology. Cooperman, Smith and Sandra Stencel (associate director, editorial) co-authored the Overview. The chapter on religious beliefs was written by Senior Researcher Besheer Mohamed. Research Associate Becka A. Alper wrote the chapter on religious practices and experiences and co-wrote, with Smith, the appendix comparing findings from the Religious Landscape Study with other religion surveys. Senior Writer Caryle Murphy wrote the chapter on views of religious institutions. The chapter on social and political attitudes was written by Mohamed and Research Assistant Claire Gecewicz. Gecewicz prepared the detailed tables. The report was number checked by Alper, Gecewicz, Mohamed, Senior Researcher Jessica Martinez and Research Associate Elizabeth Sciupac. The report was edited by Stencel, Michael Lipka, Murphy and Aleksandra Sandstrom. Bill Webster created the graphics. Stacy Rosenberg, Russell Heimlich, Diana Yoo, Besheer Mohamed, Benjamin Wormald and Juan Carlos Esparza Ochoa developed the interactive tool. Pew Research Center’s methods team provided advice on the sampling plan, questionnaire design, weighting strategy and data analysis. The methods team, led by Director of Survey Research Scott Keeter, includes incoming Director of Survey Research Courtney Kennedy, Research Methodologists Kyley McGeeney and Andrew Mercer, Research Assistant Nicholas Hatley and graduate student intern H. Yanna Yan. Others at Pew Research Center who provided research guidance include President Michael Dimock, Vice President for Research Claudia Deane and Demographer Conrad Hackett. Communications support was provided by Andrew Cohen, Rhonda Stewart, Erin O’Connell and Stefan S. Cornibert. John C. Green, director of the Ray C. Bliss Institute of Applied Politics at the University of Akron, served as a senior adviser on the Religious Landscape Studies, providing valuable advice on the survey questionnaires, categorization of respondents and drafts of the reports. Additionally, Pew Research Center received helpful comments on this report from Mike Hout, professor of sociology, New York University; Lyman A. Kellstedt, professor emeritus of political science, Wheaton College; and Corwin E. Smidt, professor emeritus of political science, Calvin College. We also received valuable advice from Luis Lugo, former director of Pew Research Center’s Religion & Public Life project, and the late Andrew Kohut, founding director of Pew Research Center. Funding for the 2014 Religious Landscape Study comes from The Pew Charitable Trusts, which received generous support for the project from Lilly Endowment Inc. While the analysis was guided by our consultations with the advisers, Pew Research Center is solely responsible for the interpretation and reporting of the data. The remainder of this report explores in greater depth many of the key findings summarized in this Overview. Chapter 1 offers a detailed look at the religious beliefs of the U.S. population and how they have changed in recent years. Chapter 2 examines religious practices and experiences. Chapter 3 includes an analysis of the public’s views of religious institutions. Chapter 4 describes the social and political values of many religious groups in the United States. Appendix A describes the methodology used to conduct the study. Appendix B compares findings from the Religious Landscape Studies with other major religion surveys and puts the current results into the context of longer-term trends.